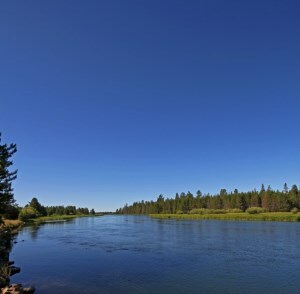 Three Rivers South, OR isn’t classified as a town or city, but a particular area south of the place known as Sunriver and just north of the Pines (La Pines). Three Rivers originated from the Deschutes (the Fall), as well as Spring Rivers which comes together in this unique area and flows throughout. The Big and Little Deschutes as well as the Fall Rivers all meet here, which ultimately forms the famous Deschutes River. South of the Sunriver is where you will find the unique diversity which makes up the residential living environments of the “Three Rivers Area”. What a beautiful spectacle to see! People who visit this area are astounded by the immaculate surroundings of National Forests, Ponderosa and Lodge Pole Pines which heavily populates the area. Not to mention, it is a fisherman’s heaven, with trophy fly fishing and trout in abundance. There are a number of communities to choose from in Three Rivers South including River Meadows, Fall River Estates, Spring River, Lazy River, River Forest Acres, Deschutes River Recreation Home Sites, Vandevert Ranch and Oregon Water Wonderlands. The area of Three Rivers South is one of a hand few areas where riverfront land can be found in all of central Oregon, at somewhat reasonable prices. Some of the neighborhoods even offer bigger home sites with smaller acreage for those interested. A vast selection of designer styles and price ranges are also made available for those desiring to live in the Three Rivers South, OR area. River Meadows is a planned community that has personal recreational facilities which includes a community pool, tennis court, spas and bike routes. It also has a water and sewer service available for all lots including those that have the benefit of bordering the Deschutes River. Fall River Estates is actually in the heart of the Deschutes National Forest approximately 28miles Southwest of Bend, OR. It emerges from the enormous natural spring situated at the head waters which ultimately erupts quickly into a full-sized river and slowly meanders throughout the Lodge Pole Pines and Ponderosa, over a 15ft. waterfall throughout an eight-mile journey emptying into the Deschutes River. This is a tree-shaded area which creates a safe haven for campers. The glisten-loaded, swift, green rush of the marvelous area unites with the Columbia, and there’s not a better place family fun activities like hiking, camping, rafting, mountain biking, trout and world-class steelhead fishing. Words cannot describe how breathtaking these site. Three Rivers South, OR is the ideal place for those who love the great outdoors and looking forward to retiring soon. The median household income is recorded to be $33,939 and for a family it’s recorded to be $36,464.